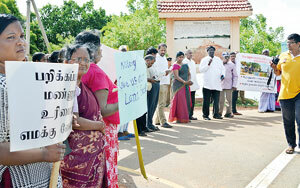 When officials from the Mullaitivu office of the Surveyor-General’s Department went this week to mark the boundaries of a plot of land to be acquired by the navy, they were turned back by residents. The officials were in the final stages of taking over 617 acres of land, at least half of it privately owned. 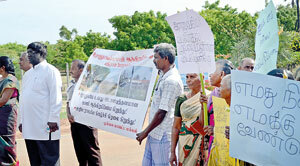 Blocking the officials from surveying the land, the residents of Vadduvaakal and Mullivaikkal in Mullaitivu staged a protest demanding their land be returned to them for resettlement and farming. 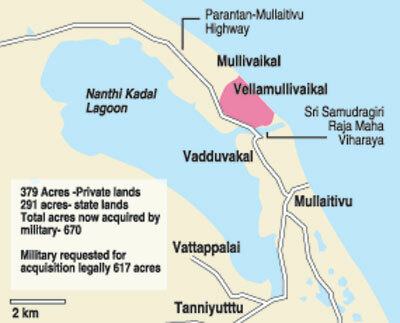 A letter of notice signed by Government Surveyor B. Navaneethan was sent to the Mullivaikal East Grama Sevaka division early this week informing residents that 617 acres of land would be acquired for security purposes following a directive from the Defence Ministry. The letter also noted the surveying process would follow, from Wednesday to Friday, and if there were any claims for ownership for those lands the officials needed to be presented with documents such as original deeds or permits at that time. Located north of Vadduvakkal bridge, the land was abandoned by residents in the final phases of the war. They allege the navy took the land and set up a naval base called “Sri Lanka Naval Ship Gotabaya” or commonly known as SLNS Gotabaya. More than 50 individuals claiming ownership of plots of this land handed in a petition to the surveying officials asking for the return of their property and stating they would oppose any move for permanent acquisition even if the government were willing to pay compensation. According to the Mullaitivu District Land Department 379 acres of the land is private land belonging to individuals and the rest of the of the 617 acres is state land that successive governments had in the past given out on permits to people for settlement. A senior official attached to the Land Department told The Sunday Times on condition of anonymity that the navy had taken over at least 670 acres of land and the current process was aimed at securing legal title deeds to 617 acres of this area. “We received complaints from people who say they have lost all their land deeds and land permit documents due to continuous displacement during war. They are helpless and cannot prove ownership of their land,” he said. Y. C. Chang, a Colombo-based entrepreneur who owns 50 acres of land in the area taken over by the navy said the government had failed to take action against land acquisition since the war. “I don’t know why the navy is trying to hold that amount of land in Mullaitivu in the name of so-called ‘security purposes’,” Mr. Chang said. “The authorities are dragging this out over a long time in the hope that the owners would give up.” Mr. Chang said he had been planning to set up an animal farm on his property that would have created employment opportunities for locals but nothing had materialised due to the navy’s occupation. Navy spokesperson Captain Akram Alavi confirmed that the Surveyor Department officials had been sent to mark the boundaries of land taken over by the navy in order to give compensation to the owners. “This land was taken over by the navy in 2009 soon after the war ended. There will be no new land acquisition. The navy will provide adequate compensation to the owners but the residents in Mullivaikkal are opposing that move,” Captain Alavi said, adding that some of the land was owned by individuals from the south. District Secretary Mrs Rupawathi Ketheeswaran said the Divisional Secretary had informed her about the Surveyor Department officials being turned back. “I have called for a detail report on this and it will be sent to the government shortly,” she said. The families disputing the navy takeover of their land are considering going to court to appeal against the arbitrary acquisition of the properties. “Most of the families depend on farming as their livelihood. Their farming lands were acquired and there have been no alternative lands given to them. Some farmers have had to take on labouring jobs to support their families,” said Deputy Chairman of Northern Provincial Council (NPC), Anthony Jeganathan, whose property also has been acquired by the navy.